Many visitors to Oregon overlook the central and eastern part of the state and head straight for the Portland area or Pacific coastline. But one of the state’s most amazing natural wonders is hidden east of the Ochoco Mountains and as a result is usually much less crowded. The Painted Hills form a colorful desert landscape that looks like something from Mars. These surreal hills are rich in color: some crimson red, others lavender-gray or striped with black and tan. The colors come from minerals in the soil like iron and manganese due to volcanic activity millions of years ago. 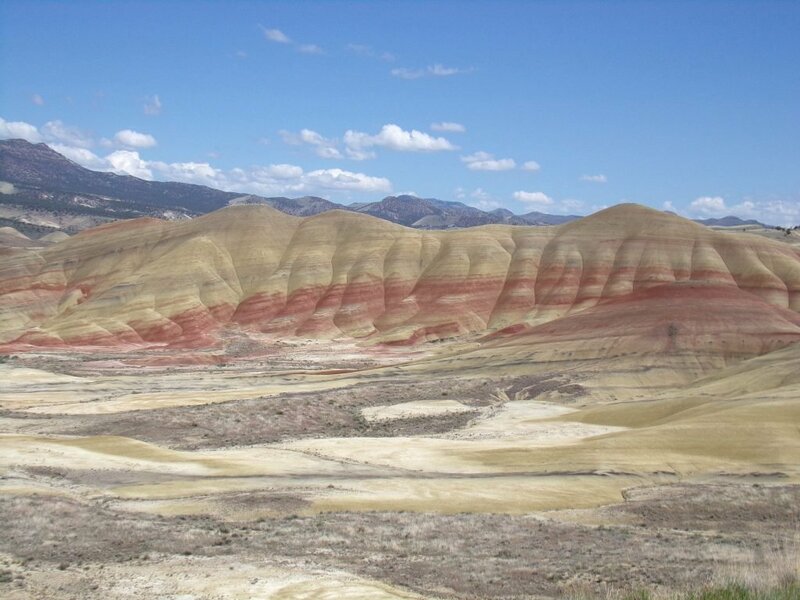 The Painted Hills are one of three units in John Day Fossil Beds National Monument. You can hike several trails around the hills for great views. Some are longer hikes (start in the morning to avoid the worst afternoon heat) while others are short and can easily be done by hikers of all ages and skill levels. We took the short 1/2 mile overlook trail uphill for a sweeping view over the hills and also drove down the road to access more trails. The Painted Cove is another short path that loops through the hills, starting on a wooden boardwalk (pictured below). Before you reach the trails, there is also a small area with picnic tables and public restrooms. The roads to the Painted Hills can fit smaller RVs like Class Cs, but camping overnight here is not permitted. You can, however, find lots of great options nearby. 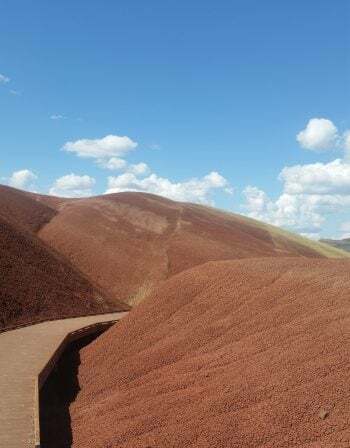 The Painted Hills are just a quick drive to the Ochoco National Forest and the small towns of Mitchell and Prineville. Ochoco Divide is off Highway 26 between Mitchell and Prineville in the Ochoco National Forest (about 40 minutes/20 miles from the Painted Hills). They have 21 large pull-through RV sites (no hookups) that can fit almost any size rig. The campground is open mid-May through mid-October and rates are only $13/night. Walton Lake is about an hour from the Painted Hills. This campground offers 29 sites (8 can accommodate RVs) under a canopy of trees and many have views of the lake. They have restrooms available but no hookups or dump station. It’s open from the Thursday before Memorial Day through mid-October. Rates are $13 a night. Priest Hole is a free place to camp only a few miles down the road from the hills. The campground is open all year round but rough winter weather can make it harder to access. It’s in a beautiful location in a valley along the John Day River and offers restrooms and a boat launch. Burnt Ranch Beach and Lower Burnt Ranch Recreation Site is about 11 miles from the hills but these sites are also free of charge. The sites are not developed and located along a sandy beach with views of rock formations. Service Creek Campground has $5 campsites on the shore of the John Day River. There are only 6 walk-in sites (no hookups) available year-round with a vault restroom and boat launch. Mule Shoe Recreation Area is another year-round campground with 6 developed sites for tents or RVs of all sizes. The BLM-maintained campground has restrooms, picnic tables, and fire rings. Spray River Front Park has 8 primitive sites along the John Day River, about an hour and a half from the Painted Hills. It’s open all year and also has restrooms, fire rings, and a boat launch for $5. Shelton Wayside County Park is open from mid-April through November 1st depending on the weather. The park has 44 first-come, first-served sites for both tents and RVs, about an hour from the hills. The sites are $5 a night, with an additional $5 charge per extra vehicle. Pets and horses are not permitted. Bear Hollow County Park is a little more than an hour from the Painted Hills in a peaceful forest setting. It’s open year-round (weather permitting) and rates are only $10 for the first night and $5 for each additional night. While you’re in the area, check out Smith Rock State Park and this hot springs resort in the Oregon desert.